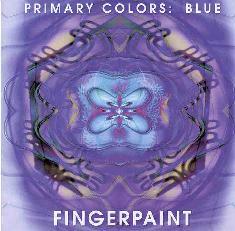 Fingerpaint - "Primary Colors: Blue"
Fingerpaint is the duo of Steev Geest and Patrick Smith who use their guitars as electronic instruments to produce interesting, often exciting, ambient journeys through mood and sound. The music is busier than most ambient soundscapes including rhythms that are quirky and playful just as often as they are soothing and meditative. "Alone, On A Beach" is really the only track where the guitars blatantly sound like guitars. But it's still electronic and atmospheric. Perhaps like a new agey Fripp soundscape. Soothing but still enough happening to hold the listener's attention. "Running With The Flood" starts off with an industrial pattern, but develops into a busy tune including atmospherics and intense percussives. Ambient guitar electronics that highlight both mood and sound. "Deep Into The New World" is a deep in space piece that, like Spacecraft, makes me feel like I'm alone in a lost drifting spaceship, surrounded by all the accompanying sounds. At 12 minutes there's plenty of room to stretch out and the track really does develop as the lost spaceship wanders out of control through the depths of outer space's astral oceans. At least that's where the tune took me, and those of you familiar with my reviews know I really dig image inducing ambient music. An excellent soundscape tune with attention grabbing atmospherics that get mucho intense. Thanks for the trip guys. "Blue Sky Darkening" is another highlight track that sounds like a space version of Fripp's soundscape work. Really tripped out guitar electronics. Fingerpaint's music doesn't sit still for long, even the most atmospheric moments including multiple layers of sounds or continually shifting patterns and textures. Finally, "Blues Unexpected" is the longest at 14 minutes, but also the quietest and the most subtle. There's still a feeling of tension but overall it's a smooth landing after the excitement of the previous tracks. To fully appreciate Fingerpaint you've got to keep in mind that all this is produced by guitars run through synths and various other efx and gadgets. But even that aside, this is creative stuff that for me is a cut above a lot of ambient space soundscape music. In fact, I think I like this one better than the more recent "In The Loop". Busy, often quirky spacescapes that will sooth you one moment and give you the jitters the next. You can visit Fingerpaint at their web site.